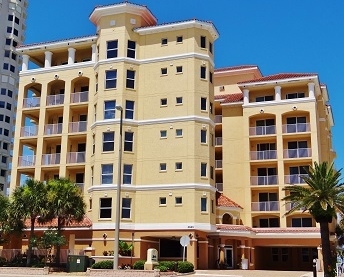 The Marbella Condominium is a private 24 unit complex inspired by Spanish Mediterranean architecture located on the "drive" beach of the Atlantic Ocean. All units are 3 bedrooms and 3 baths with a split floor plan and large balconies equipped with Jenn Air grills and porcelain tile. Enjoy breathtaking views of the Atlantic Ocean and the Halifax River from your private balcony! Bring your dogs! 2 pets up to 60 lbs allowed! Add the Marbella condo to your search for paradise at the "World's Most Famous Beach"!